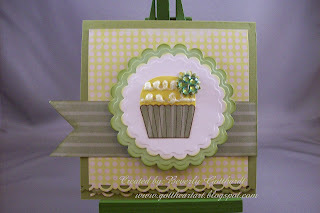 I like the crisp look of this card, but I don't like the way the icing turned out on my cupcake, should have used the Liquid Applique, but was going for some shine. Oh well, lesson learned. Supplies: 4 1/4" Square Card, Papers:Stampin Up-Whisper, Old Olive, Stampin Up-Patterns Pack III, K&Co Lovely Designer Paper, DCWV Pastel Prints, Stamps: Hot Fudge Studio/Studio G, Ink: Ranger Archival Ink-Coffee, CTMH-Z2110 Buttercup, Stampin Up-Old Olive, Stickles-Frosted Lace, Spellbinders Nestibilities-Classic Scallop Circle Lg., Prima Flower, small sparkly flower unknown, Stampin Up-Scallop Trim border punch, pop dots. Thanks for playing along with us at Paper Sundaes this week! Love your card, Bev. I think the icing is wonderful and so is that pretty gem you topped it off with. Great work on the color challenge. So happy to see you joining in the fun with Creative Inspirations this week! Love your card, perfect paper for piecing your muffin wrapper! Thanks for playing at Paper Sundaes. Very cute! I love the nesties you used :) Thanks for playing with us at Paper Sundaes! really nice, love the colors and the icing! VERY VERY Cute and clever!! So adorable! I love the frosting...it looks homemade :) Thanks for sharing at CCC!